It is extremely frustrating to get a phone call from the mortgage banker you just spent two hours with picking a mortgage, signing application documents, and emailing or faxing your bank statements and pay stubs with to hear your mortgage was denied in underwriting. I can assure you from being a mortgage banker that it’s a phone call I did not want to make. There goes a commission for me, wasted time for both of us, and the likelihood of us working again in the future along with you sending referrals is slim to none. Typically a mortgage banker will know as soon as you send over your documents if you will be approved on the loan. They will take a couple of minutes to verify everything you told them over the phone. An experienced mortgage banker will be able to spot things right then and there if things are matching up. Inexperienced ones may miss something but if everything looks good they send your info to the underwriting team who start to process your loan. In most situations the underwriting team will know if the loan is moving forward and will be denied. The difference between the mortgage banker and the underwriter is the mortgage banker puts ranges of your income and assets on the application. Underwriters put in exact numbers and re-approve you based on those exact numbers. Sometimes the underwriting system does not like those new numbers. These are typically what the underwriting system will now say to deny your loan. Income – You don’t make as much money as you say you did. Or maybe you do but you have too much debt and its causing your debt to income ratio to be too high. Assets – You don’t have as much money as you say you did on the application. I have seen instances where 1% less income and 1% less in assets has kicked back a denial. What I recommend during the application process is to be conservative with your income and assets when talking to the mortgage banker as they will get exact numbers when you send your documents in. Credit Score – The mortgage banker will know this before it gets to the underwriters. After putting in the exact numbers you sent with your documents, the underwriting system may not like those numbers if you have a low credit score. Appraisal – If you are doing a rate/term refinance (not taking cash out) you might get lucky and the underwriting system will kick back a “Property Inspection Waiver”. This means no appraisal is needed. For a couple of years mortgage companies allowed “Automated Valuation Models” or “AVM” for second mortgages. Basically, they ran your address through a Zillow.com like system and if that value worked to do a second mortgage they would not do an appraisal either. If you are not doing a rate/term refinance or get an “AVM” that works then the underwriting system will request an appraisal. When the appraisal gets back in, the underwriter will enter what the amount came back in at and try to re-approve the loan. If the appraisal came back lower than initially thought than the loan might be denied. 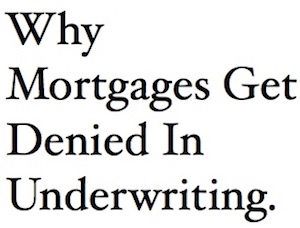 This is the #1 reason why loans get denied and there is nothing the mortgage banker or underwriter can do. In most cases the value of the house has to come back pretty close as to what was stated on the application. This is one piece of the puzzle that is out of the hands of all parties. In some cases the mortgage company will send out another appraisal if they don’t believe the appraiser did a good job. They may even ask for a “Value Appeal” if the mortgage company sees the appraiser took comparables tens or hundreds of miles away. I had this happen with a client who lived in Vail. The appraiser used comps in Denver, some 120 miles away. Absolutely not. Its just if the mortgage company is going to pay for it or if they make you pay for it. Many mortgage companies make you pay up front for an appraisal and it is non-refundable. If the loan gets denied because the mortgage banker did not ask an important question then you might get your money back from them because of a mistake. If you told them the house was worth more and it came in lower than its on you. Recently Listed For Sale – At application the mortgage banker should ask you if the house was recently listed for sale. Lets say it was but you lied and told them no. During underwriting the team will look at the appraisal. On it, the appraiser will look through the MLS (Multiple Listing Service) and see if it was listed in the past year. If so, the underwriting team will notice that and possibly deny the loan. Most mortgage companies have a 6 to 12 month de-listing period before allowing a home to be refinanced. The reason they don’t refinance to people who recently listed their house for sale is you might be doing this for a short term fix to consolidate debt while you try to sell the house. Maybe you can’t sell the house and by doing the quick refinance to pay off your debt you then proceed into foreclosure shortly after closing. Mortgage companies want to know you plan on staying in the home for longer than 120 days (recapture period) as they want you to keep paying on the loan. The only way around this is if you were trying to sell the house by yourself. Commonly called For Sale By Owner (FSBO). As long as you did not contact a realtor and you took the FSBO sign off your front lawn then you should be ok to proceed. If you’re buying a home than this does not affect you. Manually – A manually underwritten loan has guidelines that must be met. For instance, your debt to income ratio (DTI) must be lower than 45%, you must have at least 3 months worth of assets in a bank statement, been at your job for two straight years, credit score over 660, and no higher than 90% loan to value (LTV). Desktop Underwritten (DU) – On a desktop underwritten loan you could have a debt to income ratio of 52%, 1 month of reserves in a bank account, 90% LTV, and a 770 credit score. The computer (DU) will look at your compensating factors and determine if you are a good risk to lend to. Even though your qualifying factors do not match up with the manually underwriter scenarios, you have a high credit score which makes up for the other low factors. Just about every mortgage company is doing Desktop Underwritten loans because of the technology in place. The mortgage banker will send your information through the desktop underwritten system connected to Fannie Mae. If they get an approval you will be sent application documents to sign and send back along with supporting documents like pay stubs and W2’s. Be honest with what you tell the mortgage banker because if you are not the underwriter will deny you immediately. Mortgage companies are in the business to close loans, not to deny loans. They want to do everything they can to give you the loan you want. The last thing a mortgage banker wants to do is call you back the next day and say your loan was denied in the underwriting process. Be upfront with the mortgage company and answer every question they ask. If you do this then you are protecting yourself from having your loan denied even if your appraisal comes in where you wanted it to come in at. Work with larger companies that close a lot of loans every month. They communicate faster with their clients if something goes wrong while in process. If your loan gets denied in underwriting it is more than likely from something you did not disclose during the application process. In some cases it might be an inexperienced mortgage banker did not ask the right question. Underwriters have to find out if there are any back taxes, how long you’ve been at your job, if you are the only person on the deed, and if there are other liens on the property like a home equity line of credit. If they find out that you have any of these and did not tell them ahead of time the loan could get denied for any of these too. Property and income taxes must all be brought up to date. Liens on the property including collections, child support, alimony, etc. must be paid up too. Be aware that if your loan gets denied in underwriting at one place it will probably happen at another. Most mortgage companies follow the guidelines set forth by Fannie Mae. Take the time to address whatever reasons the loan was denied for (outside of appraisal) and you will more than likely be able to get approved soon.